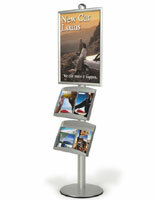 This snap frame also has a pocket mounted on the front perfect for brochures. 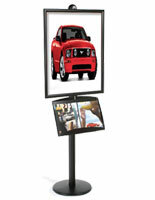 Enhance your trade show display or floor and showroom exhibit with this large, sturdy, FORTE brochure sign stand. 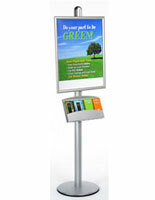 Each part of the brochure sign stand is made from quality, durable metal that make this a steadfast display. 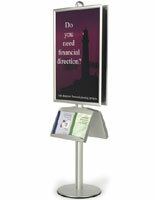 A heavy duty display, this FORTE sign stand is comprised of a 73" pole, a 24" x 36" snap frame and a steel brochure tray. 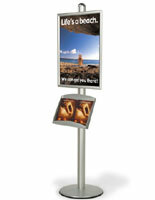 The literature holder measures 18- ¼" and accommodates either 2 A4 brochures side by side or 1 large magazine or brochure. 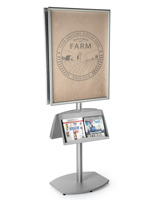 Use the tray to display additional information on your product or use it as a "take one" display to offer brochures for your customers to take with them. 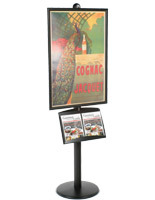 Above the brochure tray hangs a snap frame to contain your poster or large sign. 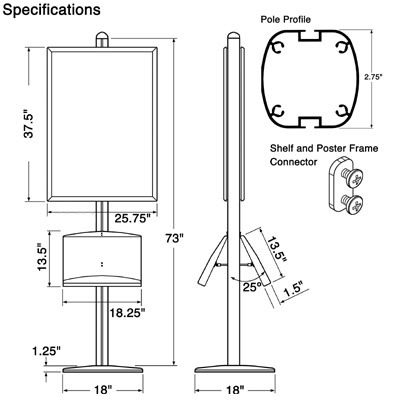 The frame sits up towards the top of the pole so that it will attract attention even from across a room. 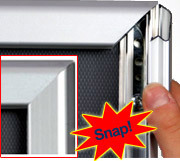 Like any other snap frame, it is easy to change your posters. A clear overlay is also provided to cover your sign and protect it from scratches. 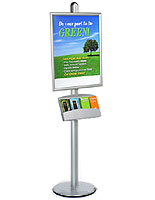 The pole and base of this brochure sign stand weigh 25 lbs which means the display cannot be easily moved. If moved, however, the base of the unit is lined with a rubber ring that will protect the floor from damage.